Treat the youngster in your life to the quality of American-made craftsmanship. Our Amish Hardwood Child's Royal Mission Chair makes for a precious keepsake that your children or grandchildren will be able to use for many years. 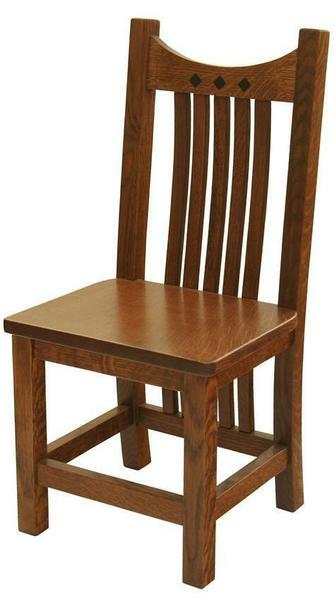 This chair comes standard in solid oak wood, but can also be ordered in cherry or quartersawn white oak. We love its beautiful diamond inlays at the crown, which add the perfect accent to this classic piece. A contoured back splat allows for hours of comfortable seating. Your child's new chair will have all of the makings of your favorite Amish furniture. Be sure to check out this design in a Kid's Rocking Chair as well. And don't forget to take a peek at the Amish Royal Mission Chair. 12.25" x 12" x 27"